Vehicle Interface Cable - The AutoWatch unit must interface with the vehicle. The OBD II AutoWatch connects to the vehicle's diagnostic wiring. The VSS AutoWatch is connected to the vehicle's VSS (electronic speed sensor) wire, power and ground. The AutoWatch model and version you purchase determines which vehicle interface cable you get. 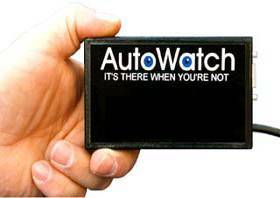 Model #: AW-DLC The DLC Plug In Version provides a quick, easy way to install the AutoWatch in your vehicle. The AutoWatch unit's cable is plugged directly into the vehicles diagnostic connector. Model #: AW-HWC The DLC Hard Wire Version provides a more permanent way to install the AutoWatch unit; however, the installation of this version of AutoWatch could be difficult. The AutoWatch unit's cable is hardwired to the vehicles diagnostic connector wiring using tap in connectors. Model #: AW-VSS The VSS AutoWatch unit is connected to the vehicles electronic speed sensor (VSS) wire, battery power and ground using tap in connectors. Serial Interface Cable- cable that connects AutoWatch to a PC for downloading and retrieving data.